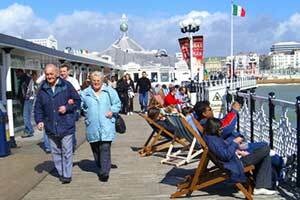 People of all ages are attracted to waterfronts. From lakeside cafes to waterfront festivals to leisurely walks and bike rides along the shore, the activities and amenities that draw in residents and visitors are endless. In Michigan – with more than 3,000 miles of Great Lakes shoreline, more than 11,000 lakes, and over 51,000 miles of rivers – there are certainly plenty of places to create fabulous waterfronts. Surrounding Buildings Enhance Public Space – Any building on the waterfront should boost activity in the public spaces around it. Limits are Placed on Residential Development – Great waterfronts are not dominated by residential development. Why? Because these are places full of people, day and night. Activities go on Round-the-Clock and Throughout the Year – Waterfronts that thrive year-round will reap substantial community and economic benefits. Flexible Design Fosters Adaptability – Successful waterfronts must adapt to many changes that bring different users at different times. Creative Amenities Boost Everyone’s Enjoyment – The best waterfronts feature amenities that increase people’s comfort and enjoyment. Access Made Easy by Boat, Bike and Foot – Waterfronts flourish when they can be access by means other than private vehicles. Local Identity is Showcased – The greatest waterfront destinations are found in cities that truly orient themselves to the water. The Water itself Draws Attention – The water itself is the greatest asset of any waterfront, and should become the centerpiece for programming and activities. Iconic Buildings Serve a Variety of Functions – Iconic, attention-grabbing buildings that reflect a human scale and do not detract from the surrounding context can be a boon to the waterfront, so long as they serve a variety of functions. Good Management Maintains Community Vision – Management is essential to ensure that a successful waterfront stays that way. More details and examples from around the country and the world are available in the full article. Many Michigan cities are treasure troves of waterfront development ideas as well. For example, Detroit’s riverfront has been transformed into beautiful parks and plazas that set the stage for a myriad of entertaining activities. And in Grand Haven, sandy Lake Michigan beaches are complemented by scenic bike trails, unique shops, boat and trolley rides, and a one-of-a-kind Musical Fountain. Through our PlacePlans projects, the League is working with a number of other communities to help them get the most out of their waterfronts. Allegan is moving forward with plans to redevelop its Kalamazoo Riverfront to make it a more inviting destination. In Cadillac, the city has begun implementing plans to redesign a lakeside block as a year-round destination and attractive connection to downtown businesses. 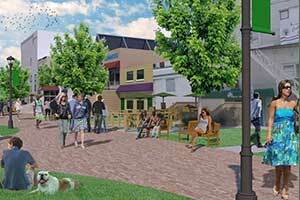 In Boyne City and Niles, current PlacePlans projects are developing designs that will amp up the value of their waterfront assets. Need more inspiration? At this year’s Convention, we’re offering even more ideas in our Sept. 16 workshop, Waves of Waterfront Economic Development Strategies. In this session, attendees will learn about waterfront projects in Traverse City and communities across the state. This entry was posted in Physical Design & Walkability, PlacePlans by Lisa Donovan. Bookmark the permalink. ONE WEEK LEFT! Scottville seeks a city manager who is a kind mentor, can wear many hats, and values technology that… t.co/tmBpuaHl0c Time ago 16 Hours via Hootsuite Inc. This guide focuses on incremental zoning reform, enabling a community to create regulatory change in a neighborhood or district before moving to the next update. This report highlights the history of placemaking, significant League efforts, and how those efforts have shaped policies and quality of life. This report looks at the connections between the eight assets of 21st century communities and community growth and prosperity. The Michigan Municipal League is the one clear voice for Michigan communities. Through advocacy at the state and federal level, we proactively represent Michigan municipalities to help them sustain highly livable, desirable, and unique places within the state.